If you ask an Indian or Vedic priest what date it is, he may say something like this: 2071 Vikram Samvat (year number), Srāvana Māsa (lunar month), Jaya Samvatsar (year name based on 60-year cycle). There are many additional details such as Tithi (lunar day), Vārā (solar day), Paksha (lunar phase etc) but in this article we will only learn about how the year and the month are derived. YEAR: In the year 57 BC, Vikrama Samvat era was founded by king Vikramāditya of Ujjain following his victory over the Sakas. King Vikramāditya’s life is also connected with the concept of Sādhe Sati but that is a topic for another article. So if we start Vedic calendar in 57 BC, then year 2014 in Gregorian calendar will translate to year 2071 (57 + 2014) in Vedic calendar. There are other Vedic systems for calculating year but Vikram Samvat is the most common. 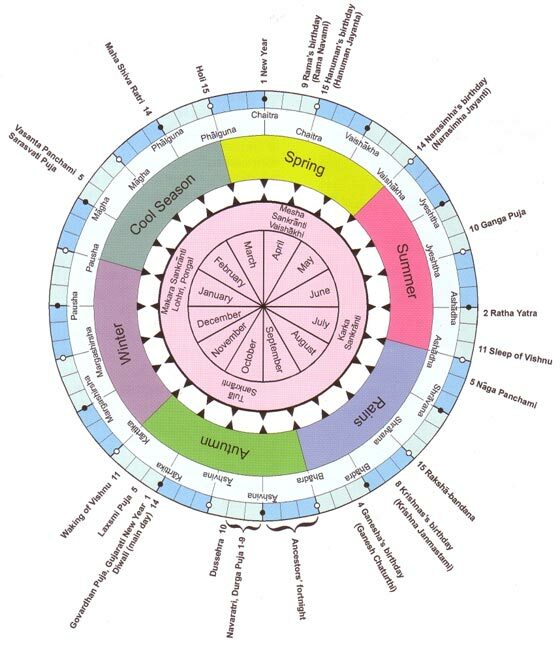 MONTH: There are 12 rāśis (signs) and there are 12 lunar months. Names of each lunar month depends on two things: a) which signs the Sun transits through that month, b) which Nakshatrā (constellation) Full Moon takes place in during that month. For example, when Sun transits from Pisces into Aries, the name of that lunar month is known as Chaitra because the Full Moon during that month takes place in the Nakshatrā of Chaitra. Next, when Sun transits from Aries into Taurus, that lunar month is called Vaiśākha because Full Moon during that month takes place in Vishākhā Nakshatrā. And so on. There are some exceptions to this rule but in its simplest terms, this is how lunar months are derived. This entry was posted in Vedas on August 11, 2014 by illuminatelifetoday.